The previous header photo showed three Gen2 Mistrals going upwind at the 2014 U.S. Classic Moth Nationals. From left to right; Jamey Rabbit, Joe Bosquet, and Mike Parsons. Photo was taken by Hope Mallott of Elizabeth City. My post on the 2014 Nationals can be found here. 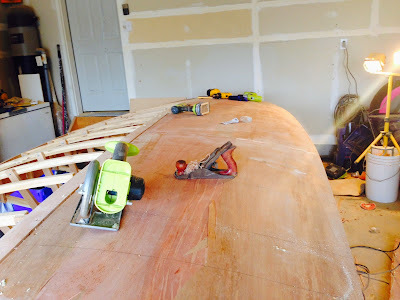 Boatbuilding: "A Piece of Furniture"
"A piece of furniture" we would often say as we eyeballed those McCutcheon or Souter built Classic International 14 dinghies, cold-molded in mahogany, glowing with multi-coats of varnish, all joints carefully crafted, beautiful wood everywhere. 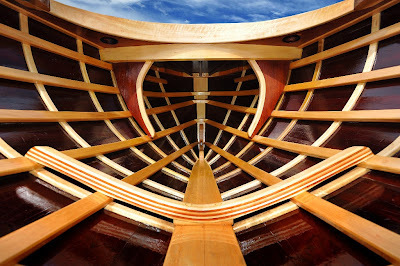 I was reminded of superior dinghy craftsmanship when I came across this stunning photo of the interior of the most recent addition to the historical Australian 18 foot skiff fleet, the reproduction Myra Too. Myra Too was built in 2013 by Bob McLeod to reconstructed lines (by Australian National Maritime Museum curator, David Payne) of the 1951 championship winner. Myra Too was originally built and raced by Aussie legend, Billy Barnett. To build the reproduction hull, Bob McLeod used silver ash and, in the inner and outer layers of the hull, Queensland red cedar (the outer layers used rare, full-length pieces estimated to be between 400 to 600 years old). 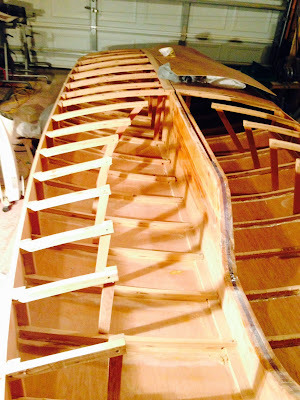 Here is the original post on Myra Too's construction from the Australian National Maritime Museum blog. From YouTube comes what, at first view, looks to be a typical mast-head GoPro video -- this of the historical 18 footer Yendys going around the course, However, with the historical 18 footers nothing is typical. Of interest to me was the spinnaker set starting at about 1:50 into the video. It takes four crew members to get the mammoth spinnaker pole out onto the mast, three of them heave-ho pushing and a fourth slotting the multi-piece pole together as it goes out. Once out, this long, long spinnaker pole then wags all over the place as they go downwind. These pre WWII 18's were heavy dinghies with lots of crew and this video shows that they pushed a lot of water around as they bashed around the race-course. The history of Yendys from the Australian National Maritime Museum blog. "A rival of Britannia, Yendys was built in 1925 by Charlie Hayes for Norm Blackman. This big hull is also built in the traditional heavy scantlings, but it illustrates an early piece of innovation, its transom bow. Hayes had another legend working for him at the time, Charlie Peel, who had been successful with transom bows on 14-foot skiffs in Victoria. As well, the 1920s was the time when the Restricted 21s showed how fast a lighter-keel boat could go, and Hayes and Peel were in the thick of this class too. Out comes Yendys, with its sawn-off profile and veed bow shapes, a sort of restricted-class yacht crossed with a skiff and with the bow overhang squared off. Despite the odd mix it went pretty well too, but although another two snub-nosers were built in that time, the idea did not catch on. It did show there was room to move in the rules, though, and the Queenslanders took on both innovation and the establishment at the same time." And a post featuring a photo of a pretty deck on a 505. David Simms of British Columbia, Canada, sends along an update on his build of the French Moth Classique Nantais design. 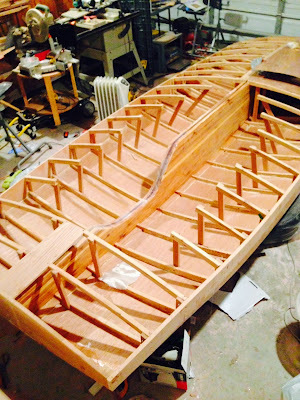 My first post on Dave's boatbuilding can be found here. "I've attached a couple of pictures of the Nantais, in its present state... All of the frames are made of laminated 1 cm x 1 cm, straight-grained Douglas Fir. I'm amazed at how light, and STRONG, they are. 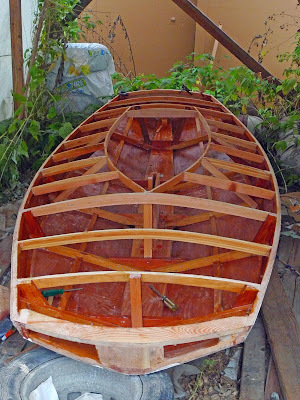 Presently, the fairing has been nearly completed and the frames have been sealed with epoxy. 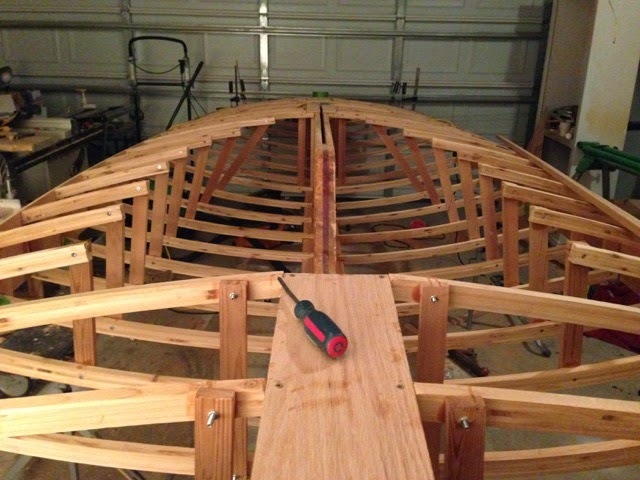 There are fewer than a dozen screws in all of the deck framing. I have rough cut the plywood for the deck and I've also sealed the inside face of the decking with epoxy. [Second picture] A bit of humour, here. 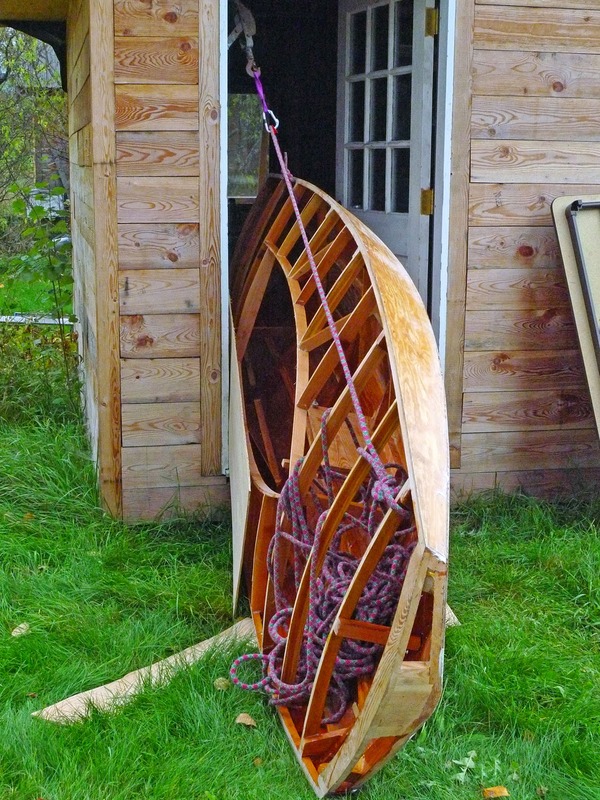 I'm struggling to move the boat into one of my sheds, for winter storage. This little struggle has convinced me that my original thoughts of building a boat that could be transported on top of a car were somewhat unrealistic. Given that I'm not related to Charles Atlas, I'll soon be looking for a trailer." Lines drawing of the Nantais Moth. Typical of Moth design for France and the U.S in the 1940's. (The Dorr-Willey, Ventnor, and the Abbots representing similar U.S. designs, Click here to view a post on the 1940 Moth designs. 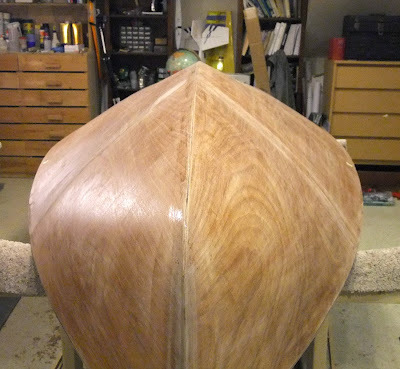 ), the hull has a scow type stem married to deep V sections. Hull panel offsets for the Mistral can be found here. In the ongoing coverage of John Z's Classic Moth build, last week I stopped over at his shop to gauge his progress and have a beer. The Classic Moth modified Mistral design is now upside down awaiting gunwhales and a layer of 4 oz. glass over the bottom. This photo, though perhaps a tad distorted, shows how deeply Vee'd the Mistral design sections are around the midships. Transom view with a pretty swirly pattern from the okoume plywood. 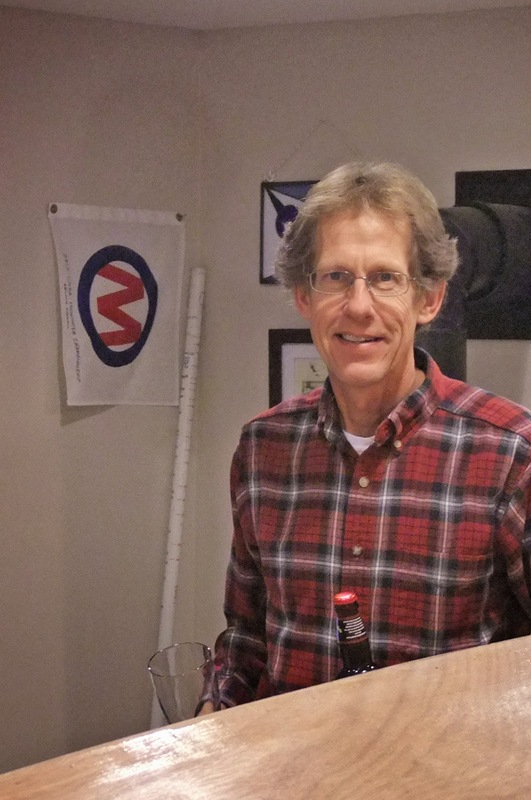 John, with the about-to-be-opened bottle of stout peeking up above the keel-line of his Moth. A man and his workbench. John graciously took down a Marblehead RC sailboat he built many years ago so I could take a closer look. 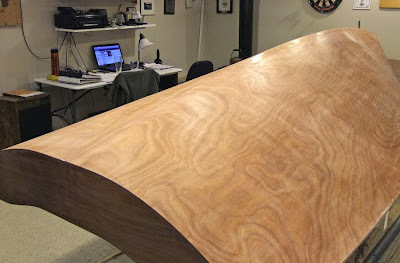 A man and his workbench - take 2. From the previous photo, you can see that John has some interesting stuff hanging from his walls. This is the box containing his F1 rubber-band indoor airplanes. These are extremely finicky to make, with a minimum weight of one gram. John has all the various tools to test balsa density and strength; tools to strip balsa into extremely narrow widths; tools to check rubber band elasticity; molds to make the tricky propellers, and the various techniques to apply the ultra-thin microfilm covering. To make a F1 takes a methodical, painstaking craftsman. 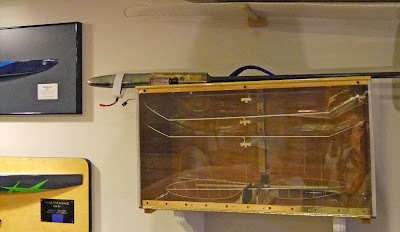 John also has two half models of the America's Cup, IACC keelboats, the class that precedes the current foiling catamarans. 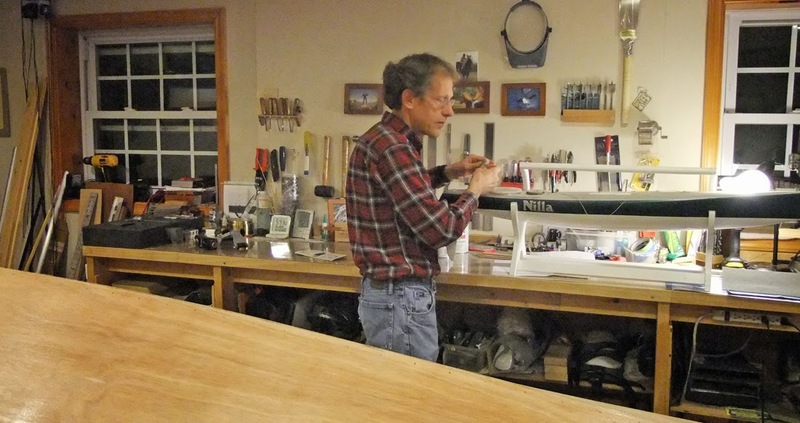 Surprisingly, it was through his wife's connections and not his Naval Architect circle of friends that these two half-models now grace his shop. 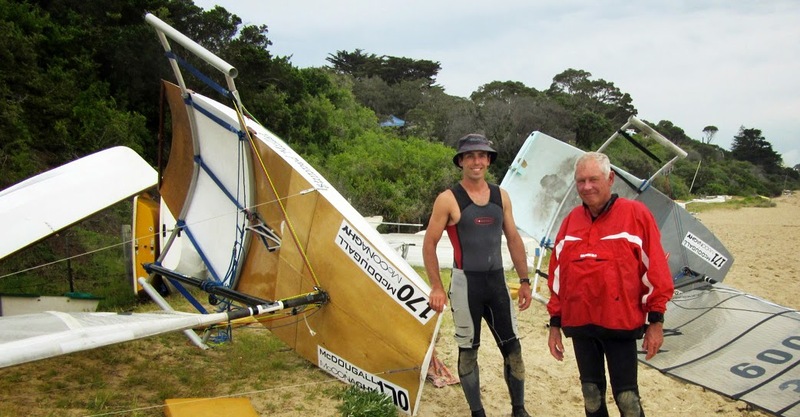 As we speak, South Gippsland Y.C is hosting Australia's Classic Wooden Dinghy Regatta. Click here to view a short video with the highlights from 2014's Classic Wooden Dinghy Regatta. Or, Click here if you want to watch the full length, 25 minute, version of the 2014 Classic Wooden Dinghy Regatta. Other posts on the Lark scow. 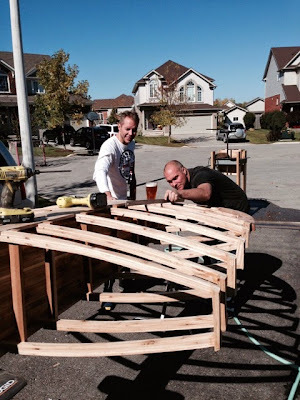 I like how these builders determine fairness using a full glass of beer as a sight-line. The solid timber side planks hold everything together before the bottom and deck goes on. There is nothing like this in entire world. In the middle of winter, 235 racing dinghies from most of the English classes, and based all around England, show up at a reservoir in West London to race a pursuit race. This year the breeze was on and Yachts and Yachting online has the story. If you are like me and can watch dinghies planing this-way-and-that-way all day long on YouTube, you'll find this video of the 2015 Bloody Mary enjoyable. It's nice to see the 1960's vintage Fireball placing on top. They still have symmetrical spinnakers and seeing the crew manhandle the spinnaker pole onto the mast on the spinnaker sets reminds me of my crewing days. One can also glimpse the two new singlehanders, the RS Aero and the D-Zero making appearances at the leeward mark. For a previous post on English winter sailing click here. Aussie 6-Footer as a Classic Singlehander? 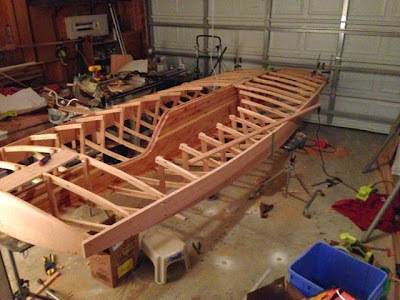 A couple of years ago it occurred to me that, if you reworked the massive rig downwards, the Aussie Historical 6-Footer skiff, would make a crazy, traditional singlehander. To that end I sketched out a cut-down sail plan which I present here. As always, use the pop-out icon on the top-right hand to open the drawing in another tab. Music Whenever: "This Train is Bound for Glory"
In the depths of winter, where the winter sun is wan and disappears fast and the cold keeps coming; nothing like a boozy and/or reefer madness, let-it-all hang out, sing-along to raise the spirits. Mumford and Sons, Edward Sharp and the Magnetic Zeros, The Old Crow Medicine Show, and others join together in a joyous hoedown of the classic gospel song, "This Train is Bound for Glory". Join me in singing and smiling to the computer. This train, done carried my mother, this train. This train is leaving in the morning, this train. Great God Almighty, a new day is dawning! Seven Australian scows, a mixture of old and new, are sailing in the 2015 International Moth Worlds hosted by the Sorrento Sailing Couta Boat Club, Victoria, Australia. For news on the 2015 Moth Worlds, it is worth clicking over to the popular Sailing Anarchy blog for Mr. Clean has been omnipresent, recording races live, doing interviews and documenting the ups and downs, both on-shore and in-the-water, of the professional programs that dominate the hi-tech foiler crowd. The scows are definitely the amateur, old-fashioned, side-show in this regatta, but, to Sailing Anarchy's credit, they have been devoting some of their coverage to the scow crowd. 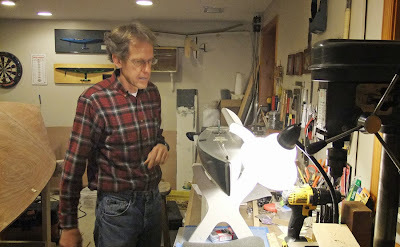 Mark has a blog on his M-Scow-03 design which offers up, for free, the plans for this scow Moth. There are 10 PDF plans as well as CAD cut files available for download. Here is one of his PDF sheets. Very high quality CAD work here. Again to open this PDF in another tab, click on the pop-out icon (the box with the upward facing arrow, upper right corner). Ah, it seems the blogmeister has lost his train of thought and digressed away from the scows in the 2015 Worlds...but, patience dear reader, there is a connection. It turns out the Brian Sherring, the owner and builder of the first M-Scow-03 is sailing at the Worlds and he was the subject of a Mr. Clean interview which can be seen over here on Facebook. There are two other scow photos of interest from the 2015 Moth Worlds, both of them I'm reposting from Sailing Anarchy (again a TOH to Sailing Anarchy for covering some of the scow stuff). Back in 2011 I covered the start of the inaugural Elf Classic Yacht Race run in June from Annapolis, across the Chesapeake Bay to the always popular Eastern Shore harbor of St. Michaels. The centerpiece of the race and the race's namesake is the restored 1888 Lawley topsail cutter, the Elf. I didn't catch the start of this year's race but in addition to Elf and the participation of the two reproduction Sandbaggers, based in Annapolis, a very brave Log Canoe crew ventured way, way out of their traditional confines of Eastern Shore river racing and dared the Bay crossing as well. I came across this very good video documenting the 2014, Elf Classic Race. 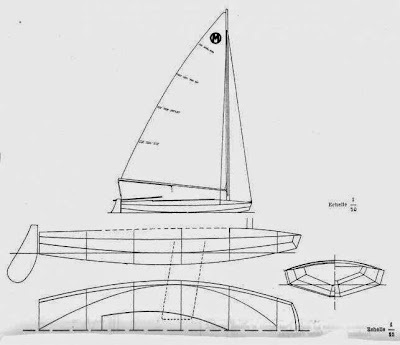 As I mentioned in my original post about the 1897 Lark scow, Bill Kerr redrew the plans for the Erieau Y.C. fleet in 1963. All the new Lark builds at Erieau Y.C. follow his plans. 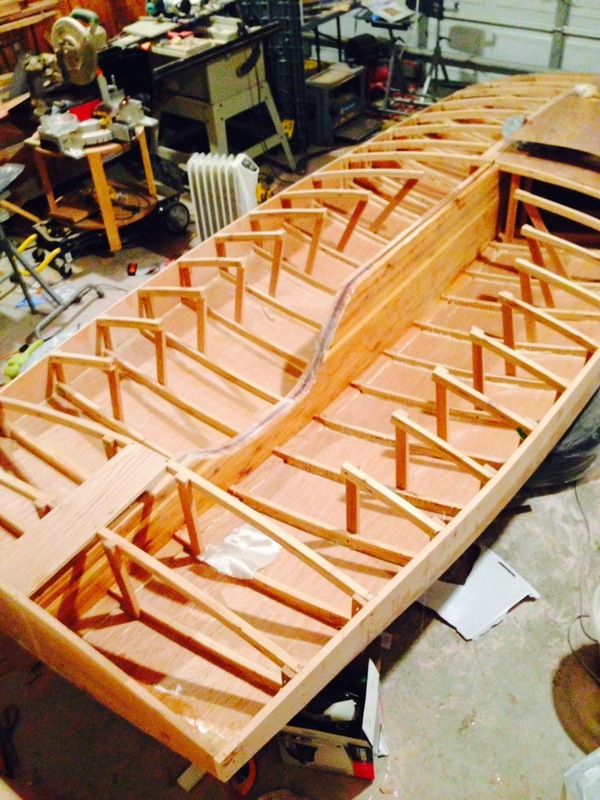 Peter Gilbert from the Erieau fleet has kindly sent along the Kerr plans. I chunked them into two PDF files; an instruction manual PDF and a drawing PDF. 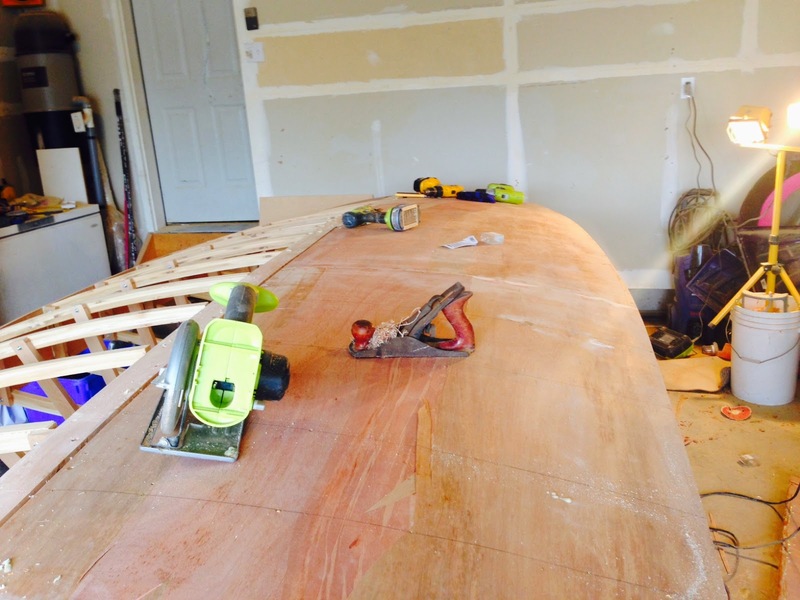 Note: Click here for the 1940 Rudder plans. 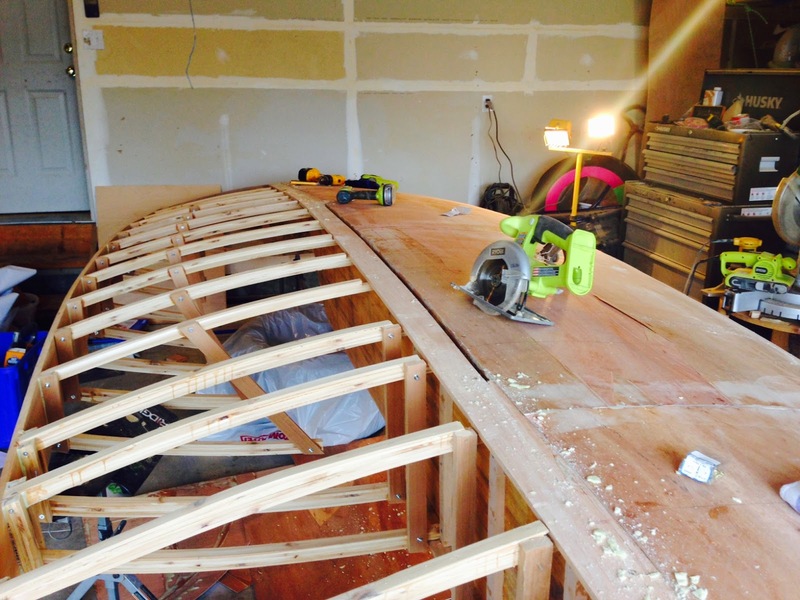 For Rudder's second DIY scow, the Swallow, click here. 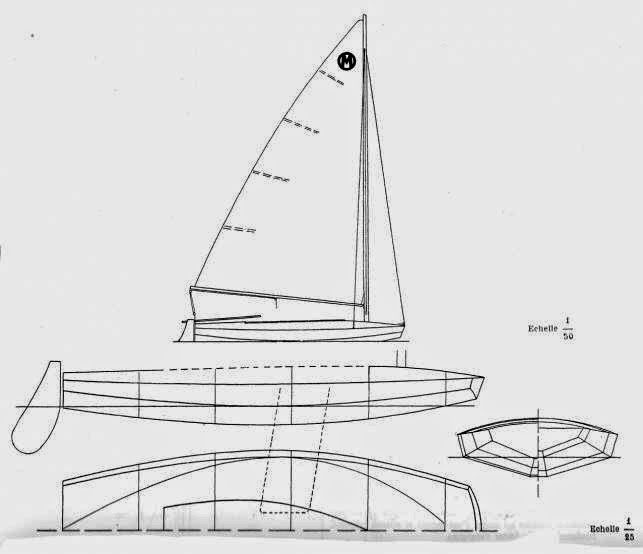 In the battle in the sailing marketplace to be the next "modern" singlehanded racing dinghy there is, besides the RS Aero, the Devoti D-Zero, designed by Brit Dan Holman. Visually the D-Zero looks more "swoopier" than the Aero and the snout, the area in front of the mast, looks more pronounced. The D-Zero is not as super-light as the RS Aero (but at 42kg still very light). 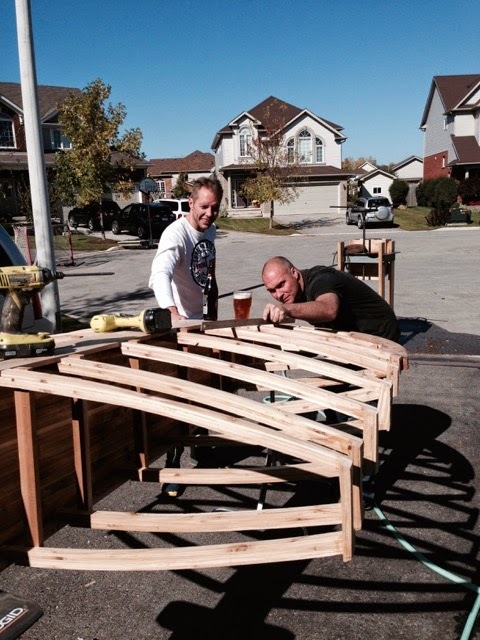 There is the rumor on the InterWebs that Melges also has a 14-foot singlehander in pre-production testing. This will add an interesting third new singlehander to the mix; a development bemoaned by some as cluttering up consumer choice and prohibiting one class from gaining traction. However, it is not a bad move by Melges, given the odd tendency of Americans not to buy sailboats that were foreign designed or built (or if they were foreign designed we need to re-work them such as the Collegiate 420 or Collegiate FJ). 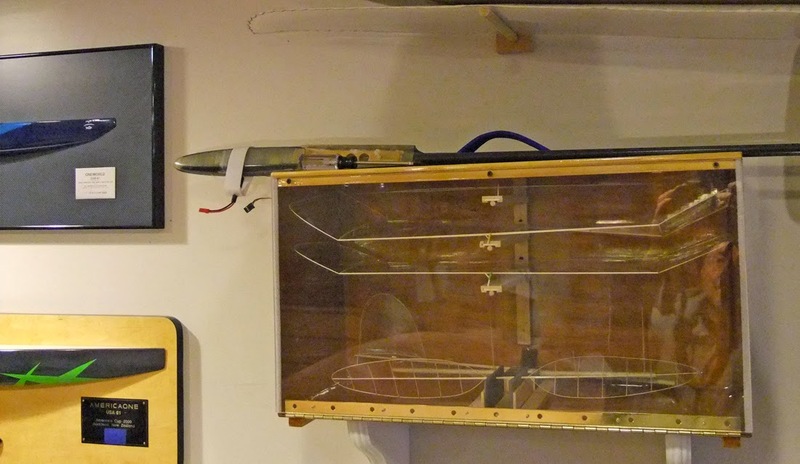 Back in Mark 2014, I did a post of the unveiling of the RS Aero and Devotti D-Zero at the London Dinghy Exhibition. As promised, a send-them reaching video of the Devotti D-Zero.